Crush syndrome is the second most common cause of death after earthquakes (the first most common is direct trauma). Many logistic problems with the treatment of patients with crush syndrome are due to chaotic disaster circumstances; consequently, medical and logistic recommendations on the treatment of crush victims are needed. In a joint initiative of the Renal Disaster Relief Task Force of the International Society of Nephrology and European Renal Best Practice, a work group of nephrologists, intensivists, surgeons, and logisticians with disaster experience or experts in guideline preparation collaborated to provide comprehensive information and recommendations on the management of crush casualties considering their occurrence with “epidemic” dimensions after mass disasters. The result is the monograph “Recommendations for the Management of Crush Victims in Mass Disasters”, which may help provide effective health care to disaster victims with renal problems. This article discusses medical and logistic principles of the treatment of crush victims, both at the disaster field and on admission to hospitals, and guidance is described. The importance of early fluid administration even before extrication of the victims and avoidance of potassium-containing solutions during the treatment of crush victims is underlined. Also, the logistic problems in treating crush casualties are emphasized. The most important aspects of the recently published recommendations are highlighted. Disasters cause a considerable number of deaths and injuries. In the first decade of this century, 3852 disasters killed more than 780,000 people, affected more than 2 billion others, and cost more than $960 billion (1). Unlike hurricanes, tornadoes, floods, and volcanic eruptions, earthquakes are completely unpredictable; the death toll can be decreased only by optimizing treatment of injured victims (2). Crush syndrome is the most frequent cause of death after earthquakes, apart from trauma (3). However, its importance is not always appreciated because of its infrequency in everyday practice; in addition, several well known nephrology textbooks do not mention it (4,5). Hence, during several recent rescue interventions, lack of experience and knowledge resulted in sometimes fatal malpractice (6). To decrease the extent of mistakes in treating crush victims, clear guidelines are needed. Therefore, a work group of nephrologists, intensivists, surgeons, and logisticians has collaborated to provide comprehensive information and recommendations on the management of crush casualties considering their “epidemic” occurrence after mass disasters (7). In the present publication, we discuss several principles concerning the treatment of crush victims as provided in the main text of these recently published “Recommendations for the Management of Crush Victims in Mass Disasters” (8). In the text below, the specific corresponding recommendations are referred to between square brackets. After mass disasters, the number of casualties is overwhelming and health care possibilities are limited, necessitating triage with focus on patients in whom life-saving therapy is possible (9). In previous mass disasters, crush victims have been ignored because of lack of availability of dialysis (10). However, energetic fluid administration prevents crush syndrome. After the Bingol-Turkey earthquake in 2003, early fluid resuscitation was associated with a lower percentage of crush cases requiring dialysis (11) than in other contemporaneous disasters (12,13). Similarly, in the recent Haiti earthquake, dialysis could be avoided in several victims because of intensive fluid administration (14). Therefore, limited dialysis possibilities should not be a reason for abandoning crush victims; with thorough fluid administration, dialysis can often be avoided. Fluid resuscitation in crush victims of mass disasters before, during, and after extrication. Modified from ref. 8. *For details, see text (Principle 2); **Ideally isotonic saline. IV, intravenous. Time spent under the rubble. More fluid is needed for victims who are rescued with some delay. If extrication is delayed by several days, however, a more conservative approach that considers the likelihood of established anuria is needed. In the Marmara earthquake, more fluid was infused in victims in need of dialysis (20), mainly because they were admitted several days after the disaster without urinary response to fluids, resulting in hypervolemia and a high need for dialysis. Length of extrication procedure. The extrication period for entrapped victims varies from several minutes to hours. If fluid resuscitation has been started with the victim still under the rubble, as preferred, the initial fluid administration rate should be 1000 ml/hr, to be tapered by at least 50% after 2 hours (Figure 1). Volume status and urine flow. Symptoms of fluid depletion, bleeding, and third spacing suggest hypovolemia, which necessitates more fluid administration; less fluid should be given with signs of hypervolemia, especially in anuria. Dimensions of the disaster. In mass disasters fluids should be restricted to 3–6 L/d if close monitoring is impossible (Figure 1). Demographic characteristics of the victims. Older victims, children, and patients with low body mass or with mild trauma are more prone to volume overload and should receive less fluid. Environmental conditions. Less fluid is needed in the case of low ambient temperatures. Disasters are associated with serious logistic drawbacks; local pharmacies and hospitals are often damaged, and external help is delayed (7,12,21). Therapeutic resources may be scarce, especially during the first days. In view of its vital importance to prevent crush syndrome, giving any available fluid without distinction is often considered. However, fluids are not devoid of side effects; thus, one should take into account several medical and logistic benefits and drawbacks of each solution. 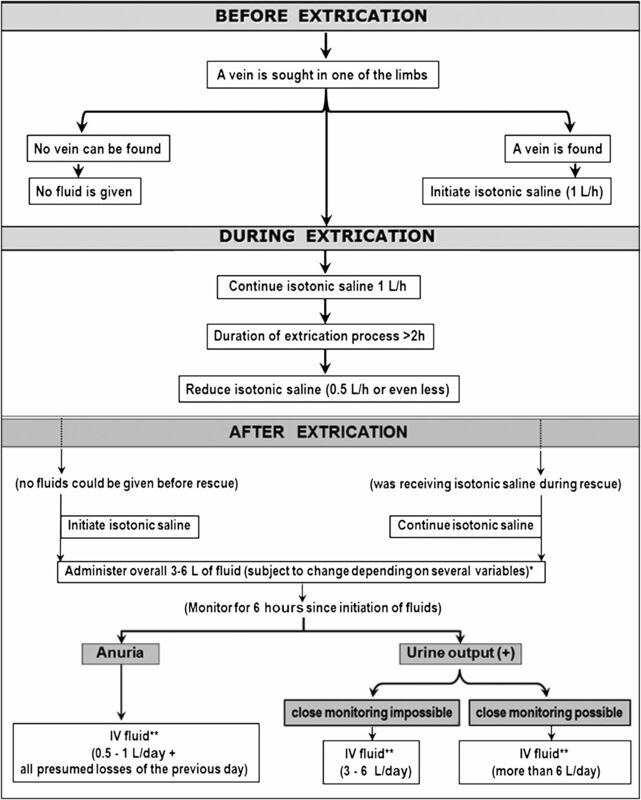 Isotonic saline is the first option because it is effective for volume replacement and prevention of AKI; it is readily available and carries a low risk for complications. Sodium bicarbonate solutions added to half-isotonic saline prevent tubular deposition of myoglobin and uric acid, correct metabolic acidosis, reduce hyperkalemia, but are usually not available in chaotic circumstances. Not all fluids are safe in crush syndrome; solutions containing even small amounts of potassium (e.g., Ringer lactate) should be avoided because fatal hyperkalemia may occur at any moment, even in the absence of renal failure (22). There is some controversy about the administration of mannitol to disaster crush victims. Mannitol has diuretic, antioxidant, and vasodilatory properties; prevents renal tubular cast deposition; expands extracellular volume; and reduces intracompartmental pressure, muscle edema, and pain (23–25). It may replace or at least buy time to perform surgical fasciotomy (26). Therefore, one might consider administering mannitol to all crush victims. On the other hand, mannitol may cause congestive heart failure and nephrotoxicity (27), and it requires close monitoring, which is often impossible after massive disasters. The efficacy of mannitol in traumatic rhabdomyolysis is controversial (28); it is contraindicated in oliguria, hypervolemia, hypertension, and heart failure. The decision to administer mannitol should be individualized because of several important side effects that necessitate close monitoring [II.6.A]. If mannitol administration is nevertheless considered, response to a test dose should first be assessed, with continuation only in the case of a positive urinary response. After extrication, reperfusion of crushed extremities results in the release of myoglobin and other toxic metabolites into the circulation. Hence, it has been suggested that the subsequent crush syndrome may be prevented by applying a proximal tourniquet to the injured extremities (29). In addition to controlling massive hemorrhage (30), this is another reason for systematic tourniquet application. However, the prolonged application of tourniquets may expose the patient to palsy, myonecrosis, thrombosis, rigor, blisters, abrasions, contusions, and pinching lesions (31), while a massive amount of myoglobin is liberated upon tourniquet release. Hence, tourniquets should be used not to prevent crush syndrome but rather only to treat life-threatening bleeding. Patients in whom tourniquets cannot be avoided should receive evacuation priority. Tourniquets should be removed as soon as possible to limit ischemic tissue damage. In crush cases, shifting of calcium into the muscles, hyperphosphatemia, resistance to parathyroid hormone, suppressed calcitriol synthesis, and kidney failure may result in hypocalcemia (32–34), which carries the risk for tetany, seizures, and cardiotoxicity (15,35). Hence, one might consider treating hypocalcemia as soon as possible. On the other hand, hypercalcemia is frequent in crush victims as well, especially during recovery, because of mobilization of the previously precipitated calcium salts from the muscles, return of sensitivity to parathyroid hormone, and recovery of vitamin D synthesis (32,36). During hypercalcemia, which is more common in crush patients who previously received calcium salts, tissular calcium precipitation may trigger cell damage and subsequent complications (17,37,38). Hence, to avoid this, hypocalcemia should be treated only in case of symptoms. In crush victims, increased compartmental pressure impairs muscular microvascular flow, causing necrosis (34,39). Fasciotomy is the most effective intervention for decreasing pressure. It seems conceivable to perform fasciotomy routinely in all crush victims to prevent distal ischemia and deterioration of rhabdomyolysis (40,41); renal failure, the severity of which is related to the extent of rhabdomyolysis (42–44); irreversible neurologic damage (40,45,46); and soft tissue and bone infection (44,47). Therefore, routine fasciotomy is considered to decrease intracompartmental pressure and prevent crush syndrome. However, fasciotomy carries the risk for infections due to the creation of open wounds, which increases the risk for sepsis (18,48,49), amputation (50), and death (51); hemodynamic instability (50,52); and chronic nerve dysfunction (53). Thus, routine fasciotomy has frequently been discouraged (18,48) and is even contraindicated in closed crush wounds (52). The only indications are absence of distal pulses; requirement of radical debridement of necrotic muscle (18,54 ); intracompartmental pressures >30–40 mmHg (43,45,55,56), especially without decrease within 6 hours (15 ); or differences between compartmental pressure and diastolic BP <30 mmHg (17). In crush patients, tissue necrosis results in myoglobin and potassium release, infection, sepsis, and eventually death (34,57). By removing necrotic tissue, amputations may prevent these complications; hence, in some disasters, amputations have been performed in up to 59% of all crush victims (58). However, amputations are often followed by an acute general deterioration both physically and psychologically. They should not be performed to prevent crush syndrome but rather should be done only when clearly indicated, such as for a limb that cannot be rescued because of life-threatening sepsis or systemic inflammatory response syndrome. If unavoidable, amputations should be performed early, when physiologic and psychologic tolerance is better (34,57). Dialysis is life saving in patients with AKI. Although early initiation of dialysis may intuitively seem beneficial, the evidence base is inconsistent (59). Renal replacement therapy (RRT) is most often started after consideration of clinical features of volume overload and biochemical features of solute imbalance (azotemia, hyperkalemia, and severe acidosis). In the absence of these factors, there is a tendency to postpone the start of dialysis (60). Data on frequency and efficacy of dialysis are controversial as well; intensive or frequent dialysis may (61–64) or may not (65,66) improve the final outcome. Therefore, with regard to AKI at large, the literature does not offer convincing evidence in favor of early, frequent, or highly efficient dialysis versus a more conservative approach. However, crush-related AKI is often associated with fluid overload, hypercatabolism, acidosis, uremia, and life-threatening hyperkalemia compared with AKI due to other causes. Thus, when the risk for complications is considered, there are fewer constraints on starting dialysis in crush patients than those with other causes of AKI. Not only established hyperkalemia but also rapidly increasing serum potassium should be an indication for dialysis (15). Given the limited availability of dialysis in disaster situations, the dose or frequency should be optimized on the basis of not only medical but also logistic factors. All RRT modalities (continuous RRT, intermittent hemodialysis, and peritoneal dialysis) have advantages and disadvantages for the treatment of AKI (60). Several randomized, controlled trials and meta-analyses comparing continuous RRT with intermittent hemodialysis in critically ill patients with AKI show no outcome differences among modalities (67–70). Although experience with peritoneal dialysis is limited, no superiority on outcome has been reported (60). Thus, all RRT types are equally efficient and can be used interchangeably. On the other hand, intermittent hemodialysis should be the first choice in disaster crush victims after consideration of medical and logistic assets, such as efficient clearance of potassium and possibility of treating several patients on the same machine per day, or to minimize or avoid anticoagulation in bleeding-prone patients. Peritoneal dialysis may be preferable in small children. Extrication of victims from under the rubble is complex; one might suppose that most extrication activities can be performed only by trained and specially equipped rescue teams. Thus, usually it is thought that efficient rescue and extrication cannot be initiated until trained rescue teams arrive at the disaster site. However, in many past disasters, the most efficient rescue actions after earthquakes were accomplished by ordinary people, including those in the vicinity who were uninjured, rather than by specialized teams (71,72). According to a retrospective analysis conducted after the Armenian earthquake, only 3.5% of casualties were extricated by specialized teams (73). External rescue takes at least 24–48 hours to organize, whereas rescue during this period may be critical for ultimate outcome (73–75). Hence, people living in disaster-prone regions should be trained on how to contribute to the rescue if they remain uninjured (76). Most hospital admissions take place early after a disaster; for example, most crush victims were admitted within the first 3 days after the Turkish Marmara, Japan Kobe, and US Northridge earthquakes (7,77,78). Therefore, it seems logical to schedule all available health care personnel early after a disaster to cope efficiently with the influx of victims. Nevertheless, after mass disasters there is a discrepancy between the needed and the available health care personnel. Local personnel may be unavailable because they or their relatives are affected (3). Those available may be functioning inefficiently because of shock, anxiety, and grief (79,80 ); nonstop activity may also result in burnout. Hospital admissions continue during the first week because of delays in rescue or referrals from other hospitals (7,81). Therefore, some health care personnel should not be enrolled early but rather should be become operational only later on. Nonstop activity should be avoided to prevent burnout. A supervisor should be assigned to evaluate for exhaustion and decide when personnel have to take a rest. The most experienced personnel should be allocated during the first days because the mortality rate is higher in the early admitted victims (7). In AKI, infectious, pulmonary, cardiovascular, hematologic, gastrointestinal, neurologic, and psychiatric complications increase mortality (51,82–85). It is unclear which victims will develop a full-blown crush syndrome, although the risk increases with severity of trauma (12). Considering the risk for crush syndrome, even in mildly injured victims (12,51), hospitalizing all crush victims can be conceived as the only way to detect and treat all potential complications. However, after mass disasters, high numbers of casualties result in a shortage of hospital beds. Mildly injured victims reaching the hospitals shortly after the disaster may occupy hospital beds that will be needed for more seriously injured casualties, who often arrive later (80). Thus, mildly injured victims should be triaged and discharged as soon as possible (80). Verbal and written instructions should be provided on how to check their condition for signs of crush syndrome, such as weight gain, edema, oliguria, and brownish urine; if those symptoms occur, the victims should return to the hospital at the earliest convenience. Crush victims often need emergency dialysis, especially for treating life-threatening hyperkalemia and volume overload (86,87). However, general utilities (such as water and electricity) may be lacking, and dialysis units can be damaged. In the aftermath of the Armenian earthquake, many rescued crush patients died because of the shortage of dialysis facilities (88); therefore, it seems logical to establish new centers in the disaster area. On the other hand, treatment of crush patients on the spot in mobile dialysis units is problematic and may cause unnecessary deaths due to surgical and medical complications. It is more logical to transport crush victims to well equipped health facilities outside the disaster area that have intensive care units, operation rooms, imaging equipment, and laboratory units. To the best of our knowledge, no instructions are available in the literature on the preferred timing of the transport of crush victims. One should consider that crush victims are prone to many life-threatening surgical and medical complications, such as bleeding wounds, hypovolemic shock, or hyperkalemia (17,22,51). Therefore, potential duration of transport, rather than the distance to be covered should be considered; ideally, crush patients should be transferred only if the duration of transport can be kept below 3–4 hours. However, the risk of longer transport should be weighed against the benefit of treatment at the end of such transport in a well equipped hospital with possibilities for up-to-date treatment. In massive disasters, transportation may not always be possible (7), necessitating institution of therapy on site despite limited resources. Logistic circumstances and medical factors should be taken into account when the decision for transport is made. In massive disasters, only patients with an at least 50% chance of survival should be treated (89) (and also transported) to preserve time and resources. Therefore, transport possibilities, especially if they are limited, should not be used for victims with a low chance of survival, such as those with substantial head injury, multiple injuries, cardiac arrest, massive burns, or hemorrhagic shock. Many bureaucratic and logistic hurdles create problems for transporting patients across national borders; hence, it is more convenient to keep victims within the country of the disaster, if possible. However, some of these problems may be overcome by logistic planning before disasters as well as by collaboration among disaster-prone countries and with humanitarian organizations during disasters, which may also be helpful for transport across borders. As an example, during the Haiti earthquake in 2010, 43 crush victims were treated in the Dominican Republic because the local Haitian infrastructure was largely destroyed (14). During disasters, chronic dialysis patients may also have problems obtaining dialysis (90). In the immediate aftermath of Hurricane Katrina, >40% of patients with ESRD missed at least one dialysis session and nearly 17% missed three or more sessions, resulting in higher hospitalization rates ( 91, 92). To reduce chaos, for predictable disasters, such as hurricanes or volcano eruptions, relocation of patients undergoing long-term dialysis should be planned in advance. Because this is impossible for earthquakes, chronic dialysis patients in earthquake-prone areas should be instructed on how to react in the case of a disaster, especially if the unit where they receive therapy is damaged. After disasters, both national and international support campaigns are started for humanitarian reasons, although they are often not as effective as desired. An analysis covering the years 1965–1975 shows that <2.5% of the disaster-generated losses were compensated by international aid (93). Even more generous campaigns might be considered as the only solution to this problem. On the other hand, random-support campaigns, if not based on specific and well defined requests, should be discouraged because they are not efficient and can even be counterproductive (94). Unsolicited donations overburden the local distribution and logistic system and increase chaos (95). After the Haiti earthquake, a donation of several thousand liters of unsolicited peritoneal dialysis fluid appeared to be of no use and necessitated transport, unpacking, sorting, storage, and ultimately destruction of tons of useless material. This caused loss of manpower and financial resources and at the same time created a risk for health and environment (80,93,96). Therefore, material donations should be limited to what is requested (14,97,98 ) and should be coordinated with teams in the affected area. Nongovernment organizations (such as Médecins Sans Frontières [Doctors Without Borders]) and scientific societies (in case of renal disasters, international and national nephrology associations, such as American Society of Nephrology) may play a role in educating rescue helpers as well as the general population in the specific actions needed in disasters. They may also offer ad hoc support to the affected areas, in so far as this occurs in a structured way, on the basis of a rescue plan developed in advance and in response to the needs and requests expressed in the field. Medical and logistic principles in disaster victims may be different from those of routine practice. To minimize the risk for treatment errors, clear and pragmatic guidance is essential. The recently published “Recommendations for the Management of Crush Victims in Mass Disasters” (8) may help provide effective health care to disaster victims with renal problems. Interested readers, especially those living in disaster-prone areas, are encouraged to consult the full document, with its comprehensive recommendations and extensive rationale. “Recommendations for the Management of Crush Victims in Mass Disasters‏” is a joint initiative of the Renal Disaster Relief Task Force of the International Society of Nephrology and European Renal Best Practice. The following colleagues served as the members of the Work Group on this initiative: Itamar Ashkenazi, Gavin Becker, Ori Better, Adrian Covic, Martin De Smet, Kai-Uwe Eckardt, Garabed Eknoyan, Noel Gibney, Eric Hoste, Rumeyza Kazancioglu, Norbert Lameire, Valerie Luyckx, Didier Portilla, Serhan Tuglular, and Wim Van Biesen. Brenner B: Brenner and Rector's The Kidney, 8th Ed., Philadelphia, PA, Saunders-Elsevier, 2008, p I-38. Schrier R: Diseases of the Kidney and Urinary Tract, 8th Ed., Philadelphia, PA, Lippincott Williams & Wilkins, 2007, pp I-11.